My Charles Dickens Challenge has come to an end with this book, and I have to say it was a bit of an odd way to finish. As the title suggests, it focuses on Edwin Drood, a young man living in the cathedral city of Cloisterham and about to marry his fiancee and go abroad to train as an engineer, who disappears in mysterious circumstances. In an odd way it almost felt like somebody trying to write a parody of a Dickens novel; something about the language never felt quite right to me and doesn't hit its stride until the end (which is really the middle as it's unfinished). However, the claustrophic atmosphere of Cloisterham is brilliantly done and there are some particularly good characters, such as the villainous Jasper - I always prefer my antagonists a bit shadowy compared to the out-and-out bad guys. Plus I really liked the development of Rosa, Edwin's fiancee, from a relatively meek girl at the beginning into a young woman taking control of her own life. 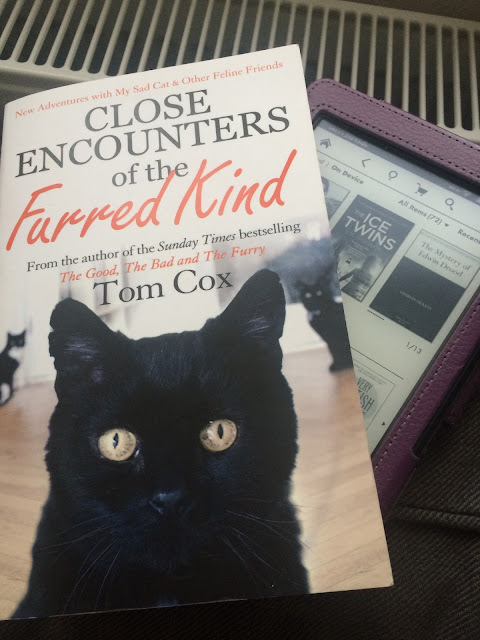 I'm a huge fan of the MYSADCAT Twitter feed, which follows the exploits of The Bear, a 19-year-old cat with the saddest eyes you've ever seen who belongs to writer Tom Cox. This is the fourth book about Tom and his four cats (he also owns Ralph, Shipley and Roscoe) and follows their move from Norfolk to Devon, as well as the acquisition of a hippy ginger cat called George. If you want something light from your reading I'd definitely recommend this; it's very easy and quick to read and, although it is very funny, is more likely to raise a chuckle and a smile than an out-and-out guffaw. Tom's descriptions of the wild Devon countryside are wonderful too. Also, reading it now as a cat owner as well as a cat lover, there are a lot more moments I identify with like drinking from puddles and being irrationally terrified of household objects. My favourite read this month. I have to admit that this is not my usual sort of book, but it was a freebie with a newspaper subscription I have for work and in the interest of saving money I decided to give it a go. It's the story of Sarah and Angus Moorcroft who, in a bid to save their troubled marriage after their daughter Lydia dies, move to a remote Scottish island with their surviving daughter Kirstie, Lydia's twin. But when Kirstie tells Sarah she's Lydia, it sets off a chain of events that send their lives spiralling out of control. The book is really well-paced, utterly gripping and packed with twists and turns - which twin died? Who is lying to who? And when the final twists are revealed, it is utterly gobsmacking (I won't say what for fear of spoilers). If you're into your crime and mystery thrillers then I'd definitely suggest trying this. So all in all, not bad going! Goodreads says I'm on track to reach my goal (you can follow me here if you're so inclined) but we'll see what February brings. I already have the next few books I'd like to read planned out and a couple of mini reading goals for the year - specifically finishing all the series I've started and having a proper paperback book to read at bedtime - so hopefully that will help me to crack on.